My dad has recently updated his life list and created a beautiful book of all the birds he’s photographed. He’s been enthusiastic about adding new birds to his list, so on the morning that we chased the Smooth-billed Ani at Viera Wetlands, we checked eBird to see what other rarities were in the area. 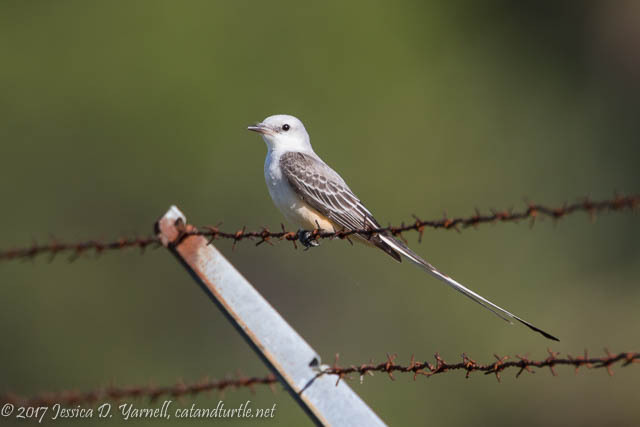 A Scissor-tailed Flycatcher has been hanging out at the Space Coast Regional Airport, not too far from our highway exit back to Orlando, so we stopped by to take a look. When we arrived at the airport, we quickly realized that the flycatcher wasn’t going to be as easy to spot as the ani. More like looking for a needle in a haystack! Knowing the behavior of a flycatcher, we realized we’d most likely find the bird sitting on a power line or a fence wire. We drove around the area slowly, to no avail. We completed a full loop and didn’t see the bird. 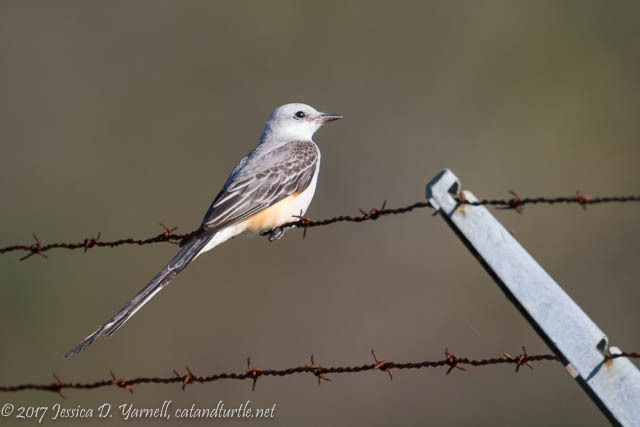 We returned to the field where the bird has been reported most frequently, spotting several American Kestrels, Eastern Phoebes, and Loggerhead Shrikes, but no flycatcher. Determined not to give up so easily, I suggested we drive around again. And voila, there was our target bird, catching flies on a fence wire! Not the most photogenic location (as happens so often with rare birds!) but such a pretty bird. The yellow and red colors under his wings are very striking, to say nothing of that long tail! We drove away happy to have added both the ani and flycatcher to my dad’s life list. Not bad for a fun day of birding! Love this one, he’s so pretty!